If you’re ever lucky enough to catch a set during which Seattle drummer Conrad Real is behind the kit, just watch him for a minute. His arms subtly move as if there are four of them. His fingers spin the drumsticks seemingly between each snare and cymbal strike. And his feet crack the bass drums on all the right counts. He’s an honest-to-goodness whirling dervish, a show unto himself. 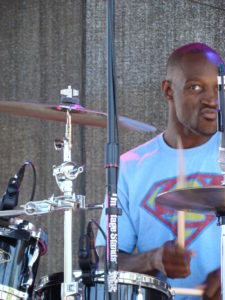 And it’s this skill that brought him to the unique opportunity to play drums with the legendary hip-hop group, Digable Planets. But before the band goes off on some tour dates this month across the country, we wanted to catch up with Real and ask him how he developed his playing style and what be brings artistically to the live Digable gigs. You’re a very expressive drummer. How did you develop your playing style? A lot of it actually came from playing in church. In those earlier years when I first started playing, a lot of it was kind of me showing off to my brothers and cousins. That translated into going into jazz band in high school and they gave me the green light to do whatever I wanted as long as it was within the confines of playing the songs. After a certain period I was just hired to do exactly what I do now for different bands. How did you become the touring drummer for Digable Planets? There was a period of time, about seven months, where everyone I was playing with just kind of stopped touring at the same time. I had to start to figure some things out so I got a day job at L.A. Fitness – as a janitor, actually – and while I was cleaning a toilet or something, the music director for the group walked up to me and asked me what I had going on, if I was touring. He asked me if I wanted to come play with Digable Planets. It was literally the right place at the right time. When you play with the band, what do you try and take from the record and what do you add to the music that’s your own style? It was tough at first because a lot of the songs aren’t as telegraphable as most music can be. A lot of the rhymes that they have over the songs aren’t your average length, either – there’s odd numbers of bars and measures. So it was just going through that process, learning to have to pay attention to detail more than usual. That was my way in to the music. Do you have a favorite gig you’ve played with the band? That’s tough, there are a few. But the one we played in South Africa might be my favorite. A lot happened on that particular day. Just getting to go to South Africa was great – I’d never even been to the continent before. Also, we got to share the stage and play with a few other artists that I really look up to, like Kamasi Washington and Brandon Coleman. You also play in the energetic Seattle funk band, Down North. What musical voice do you bring to that group as opposed to, say, Digable Planets? Playing with Down North is more free than probably any other gig that I can think of right now. I’d say the difference would be that with Down North, the bulk of the show I have more of a roll. It’s more like my presence is literally part of the show. With Digable Planets, my presence is a major part but I’m still part of the backing band – it’s not my show, per se. What musical goals do you have for the rest of the year for yourself? I want to help Down North advance to another level. I also want to get some drum endorsements of some sort – I’m overdue, I haven’t even tried to do that yet. And there are a couple of groups of my own that I want to get out touring, as well, like Seals and Real. But on a personal level, I just want to get better at what I do and play more.